Continuity mistake: When they cross the river and arrive at the other side, they are all dry. Mark Wahlberg was in the water up to his neck and sometimes higher yet he seems to be completely dry. Trivia: Makeup artist Rick Baker has a cameo appearance in this movie. He appears as one of the apes in the city who is seen smoking from a water pipe. Trivia: In order to star in the film, Tim Roth had to decline the role of Professor Severus Snape in "Harry Potter and the Philosopher's Stone" (2001). That role was eventually given to Alan Rickman. Question: Why did Thade kill the two apes that were with him after they showed him the trail left by Leo's pod? Chosen answer: To prevent anyone else from learning that Leo came from space. After Pericles' ship crashed, there was a prophecy of a second coming of Semos, the founder of Ape civilization. Thade wants to kill all humans, so if anyone found out, it would be considered a sign and the council might consider making peace with the humans. 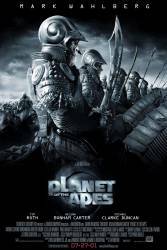 Question: Can someone please explain how the apes ended up taking over present-day Earth since the future apes never got hold of the time machine? I can't find anyone who can make heads or tails of it. Chosen answer: Tim Burton has been quoted MANY times as saying it isn't supposed to make sense. Best guess is Leo travelled not just into the future, but into another dimension as well. Ironically, this ending is far more true to Peirre Boulle's original ending than the first Apes movie. Answer: I have, if not an answer, then a sharpening of the question. A number of fanboys have suggested Thade retrieved Leo's pod from the bottom of the lake, then used it to travel into the MagnaStorm, thereby reaching Earth centuries before Leo's arrival, and inciting Earth Apes to rebel. The problem with This explanation is, once you get past how helpless the Apes are in water, How did Thade, a person who comes from a society without even gunpowder level technology, Repair A Spaceship?! Nevermind learn to use it?!?! ?.